Santa Rosa, Calif.—As it seeks to become the nation’s first 100% sustainable winegrowing region, Sonoma County’s winegrape growers voted overwhelmingly to continue self-funding the Sonoma County Winegrape Commission (Sonoma County Winegrowers) for the next five years, according to the California Department of Food and Agriculture. More than 88% of the growers who voted agreed to continue to pay a mandatory assessment on the grapes they sell to fund marketing and educational programs administered by the Commission and designed to promote and protect Sonoma County as a world-renowned wine region. “This vote marks the highest approval of the Commission since its inception in 2006 and validates that Sonoma County growers are in favor of the direction that the board and staff have taken to build awareness for Sonoma County grape growers,” stated Kevin Barr, owner of Redwood Empire Vineyard Management and chairman of the board of directors of the Sonoma County Winegrape Commission. The California Winegrape Commission Law requires that every five years a continuation referendum be conducted among winegrape growers in Crush District 3 (Sonoma and Marin Counties) for continuation for another five years. Based on results of the referendum that ended on August 15, 2015, the California Department of Food & Agriculture (CDFA) found that that the criteria required by the Law for the continuation of the program were met and the Commission is authorized to continue in operation until 2021. Increased the value of grapes in Sonoma County: Thanks to a range of effective marketing efforts, the average price per ton of grapes in Sonoma County increased more than 15% since 2010, despite two of the largest crops on record. Sonoma County Brand: Created an unprecedented partnership between Sonoma County Vintners, Sonoma County Tourism, and Sonoma County Winegrowers (Referred as the “Trio”) to leverage resources and marketing budgets, expertise, share PR agencies, and promote Sonoma County nationally through events, advertising, and other efforts. In 2012, the Trio also launched a new Sonoma County brandmark that has elevated the brand with a consistent, compelling, and unified look to increase awareness for this winegrowing region. Grant Funding: Since 2012, the Sonoma County Winegrowers has received close to a million dollars in grant funding support from the U.S. Department of Agriculture, California Department of Agriculture, Sonoma County, and others. These additional funding sources leverage dollars and support marketing and grower education programs. Strong Media Partnerships: Built national promotional partnership with Food & Wine Magazine, Wine Spectator, Wall Street Journal, Wine Enthusiast, and others that position Sonoma County as a world-class wine region. They also provide direct access to influential wine buyers and consumers through events, promotions, and advertising. Global PR and Media Exposure: In just the past three years, over 1,000 stories have been written about Sonoma County Winegrowers. These stories about grape grower’s leadership in viticulture and sustainability have reached over 100 million people around the globe. Grower Education: The organization offers approximately 50 educational programs each year that help grape growers improve farming best management practices, provide information on new and improved technologies, and provide valuable networking opportunities with industry experts and peers. Super Bowl Partnership: As a destination and wine sponsor of the Super Bowl 50 Host Committee, Sonoma County wines will be poured at VIP receptions, owners meetings, as well as media and sponsor events. Sonoma County will also be the only regional sponsor that will pour wines at the event’s “Super Bowl City” fan experience, expected to draw over a million people. The Sonoma County Winegrape Commission was founded in 2006 when the former Sonoma County Grape Growers Association voted to expand their marketing programs and create a new governing body representing all 1,800 winegrowers in Sonoma County and Marin. Since then, the organization has successfully strengthened Sonoma County’s reputation as a premium producer of high quality winegrapes through consumer research, dynamic marketing programs, and grower education and outreach. The mission of the Sonoma County Winegrowers is to increase the value of Sonoma County winegrapes and to nurture and protect this agricultural resource for future generations. 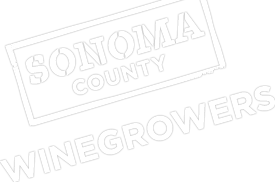 The Sonoma County Winegrape Commission (also known as Sonoma County Winegrowers) is a marketing and education organization dedicated to the promotion and preservation of Sonoma County as one of the world’s premier grape growing regions. SCW has oversight by California Department of Food and Agriculture which supports producer regions. With more than 1,800 growers, SCW’s goal is to increase awareness and recognition of the quality and diversity of Sonoma County’s grapes and wines through dynamic marketing and educational programs targeted to wine consumers around the world.